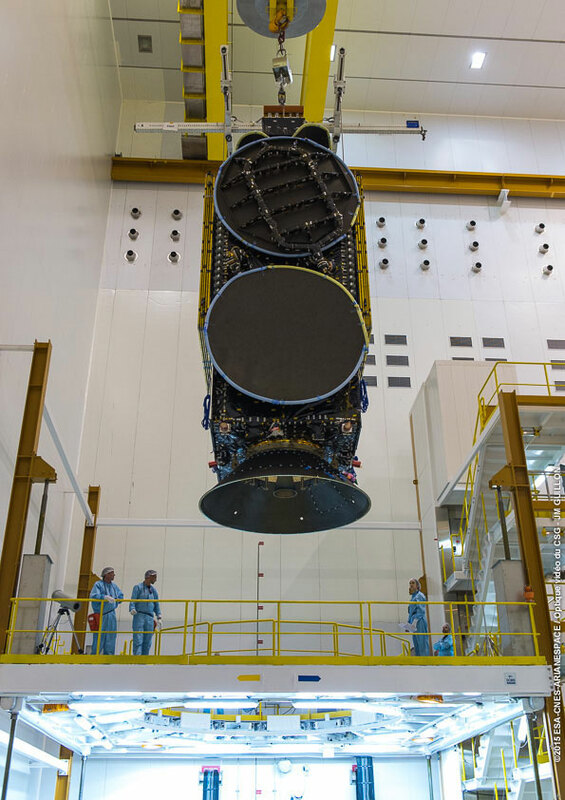 Arianespace’s next Ariane 5 flight has entered its final preparations with installation of Star One C4 on the launcher’s SYLDA dual-passenger dispenser system – positioning it for the upper slot of this July 8 mission’s payload arrangement. Star One C4 is lowered for its installation atop Ariane 5’s SYLDA structure, which serves as the dispenser system for the heavy-lift launch vehicle’s dual-satellite payload. 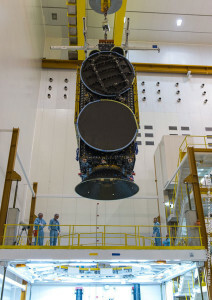 This activity occurred in the integration area of Ariane 5’s Final Assembly Building at the Spaceport, readying Star One C4 for hoisting atop the launch vehicle once its MSG-4 lower passenger – which recently was transferred to the Final Assembly Building from the Spaceport’s S5 payload processing facility – has been installed. The upcoming mission is designated Flight VA224, signifying the 224th Ariane-series launch to date. It will continue Arianespace’s busy schedule in 2015, during which the company is targeting 11 missions in total – based on the availability of payloads – using its full family of the heavy-lift Ariane 5, medium-lift Soyuz and lightweight Vega vehicles. Designed and built by SSL (Space Systems Loral), Star One C4 features 48 Ku-band transponders and is to reinforce operator Embratel Star One’s direct-to-home services in Brazil, while expanding access to other Latin American countries and to the mainland United States. The spacecraft will be positioned at 70 deg. West longitude after launch for a service lifetime of 15 years or more. Eumetsat’s MSG-4 – which was produced by a Thales Alenia Space-led European consortium – is the fourth and final satellite in Europe’s series of Meteosat Second Generation spacecraft. After launch, it will be stored in orbit, ultimately being named Meteosat-11 when it becomes operational to bridge the gap between Meteosat-10 and the initial Meteosat Third Generation spacecraft – which are scheduled to be orbited in 2019 and 2021.